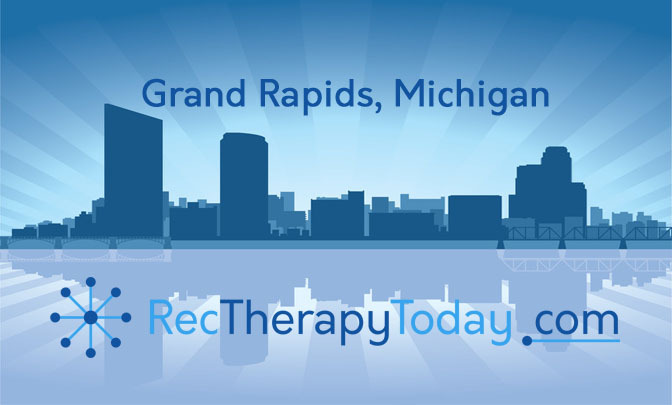 The American Therapeutic Recreation Association (ATRA) is holding their 2018 conference in Grand Rapids, Michigan. This will be the tenth ATRA session I’ve attended. I’m driving one full day up there, attending two days of session, and then driving back. I’ll be super busy, but it is worth it. I love ATRA. MapQuest estimates it will take me 7 hours and 46 minutes to get from Huntington, West Virginia to Grand Rapids, Michigan. I’ll round up to 8 hours (if traffic is good and there is no stopped traffic). ATRA conferences help people to travel and connect with rec therapists from around the world. I always love meeting people in our field. 2004: Kansas City, Missouri – I won the Peg Connolly Student Scholarship this year. The Peg Connolly student scholarship winners assisted with monitoring rooms for CEUs. My good friend and mentor Charlie Dixon (founder of the TR Directory online) was presented with the organization/ institution award. 2005: Washington, District of Columbia – I won the Advocate of the Year Award for assisting with the Recreational Therapy – Medicare Project. 2009: Minneapolis, Minnesota – Assisted with supervising the Peg Connolly student scholarship winners at the conference. (This was probably my favorite conference. I loved the group of people here). 2013: Chattanooga, Tennessee – Norma Stumbo asked me to join the Rec Therapy month task force! 2013: Pittsburgh, Pennsylvania – I presented on the healing power of self-expression. My good friend and mentor, Charlie Dixon (operator of the TR Directory) won the Fellow Distinguished Award in Recreational Therapy (FDRT) that year! Pittsburgh was close – it’s in my own state (West Virginia’s) backyard. 2016: Chicago Illinois – I presented on rec therapy for children and adolescents with abuse-reactive needs. I had applied to present two sessions at the 2018 conference, however, ATRA didn’t select these two sessions.